Place the sugar and vanilla bean paste in a mixing bowl. Add the butter into the bowl and cream the sugar into the butter. Stir in the flour and bring the dough together with your hands. Sprinkle in the freeze-dried raspberry pieces and mix them through the dough gently. Roll the dough out on a lightly floured surface until approximately 5 mm thick. 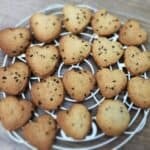 Use a heart-shaped cutter or whichever shape cutter you like to cut out your shortbreads. I made around 18 hearts. Place the shapes on a lined baking sheet. I lined my baking tray with a silicone baking sheet but you could also use baking paper. Bake at 180 degrees for 15-20 minutes until lightly golden brown. Leave the hearts to cool on the baking tray, then move to a cooling rack to cool completely.